One of the more impressive leg bodyweight exercises is a pistol squat. A pistol squat is a one legged squat where you lower yourself all the way down on one leg while using your off leg and arms for balance. When done correctly your body sort of looks like a pistol at the bottom of the exercise. In the past I toyed around a little bit with the movement but not much, mostly because of fear of what it could do to my already fragile knees. Well during my conventional leg work out yesterday (squats, leg extensions, leg curls, calf raises), I decided to throw in a few spotted leg pistols. A spotted leg pistol simply means you hold on to something as you go down to both assist in balance and provide a little assist on the way up if needed. I was able to do a few single reps on my left leg although I could feel the extreme torque from the movement straining against various connective tissue in the leg. It will tax everything from the hips down. I then tried to perform the movement on my right leg that contains my twice operated on right knee. It was a no go. Once I hit a certain depth the knee would flood with pain and the leg would collapse. I’d like to pull off some clean, unspotted reps with my left leg eventually. Last night at home I messed around with a couple movements. The first one was a bar pull over. A pull over is when you raise your legs in a similar manner as you would for a stiff leg raise, but you continue the movement where your legs go up and over the bar, allowing your body to rotate around until you are on top of the bar. It is something that sounds simple and looks simple when done by guys that are more skilled or better proportioned than I am. It is a move I toyed with in the past but never was successful at. Well I caught a video by Paul that outlined the move. I picked up one tip that helped me. I would have this problem where I had my legs up at bar height but I couldn’t get them to break the center point, I would wind up stuck upside down. Well Paul pointed out the easiest way to fix this is to bend your knees once your legs are extended upward. Doing this will tip your center of gravity in such a way that you get your hips on top of the bar. From that point you can extend your legs again so you can rotate to the upright position. This is a good skill to have if you can’t muscle up on top of a bar or are too fatigued to do so. I still look pretty awkward getting to the top position but at least I can do it consistently. I’ll shoot a video for everyone to laugh at soon. The other thing I tried was the “Zef position”, which is assuming a crucifixion type pose on the bar. This is accomplished by pulling up an then using the back of your head as a temporary hook as you slide your hands outward until they are almost fully extended. 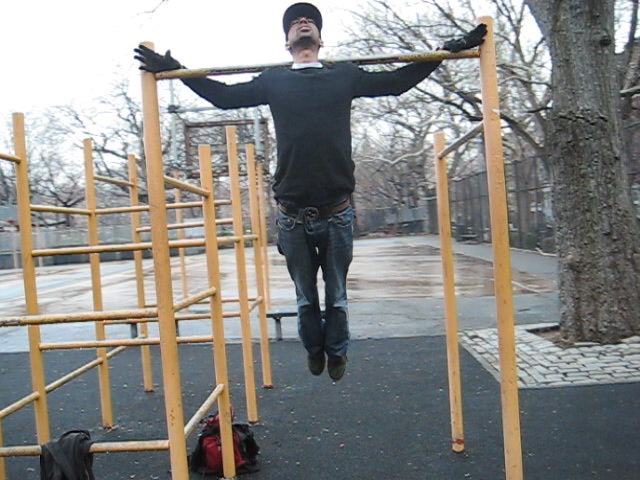 I sort of had it but it was very uncomfortable and my pull up bar isn’t wide enough for my mile long arms to fully extend. I could probably fully extend on my high bar. Maybe I will try it.